Analytics should be considered as fundamental components of each organization’s marketing strategy instead of occasionally be used for ad-hoc projects. They should drive the Strategy for better customer understanding and handling. The insight gained should be put together in the context of a Next Best Activity (NBA) Strategy, enabling the setting of "personalized" marketing objectives. 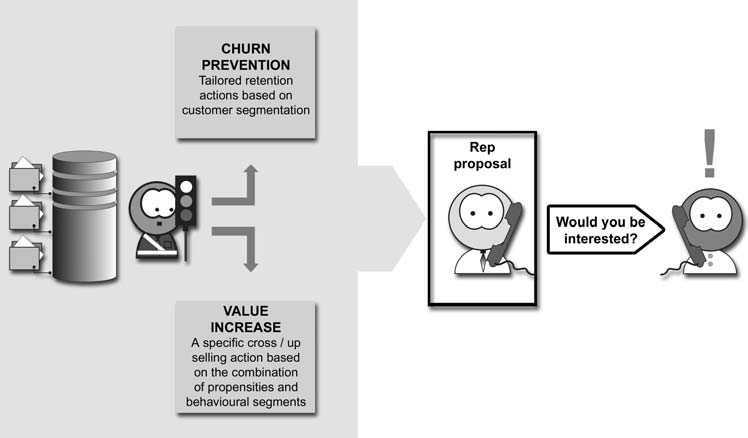 An offer for preventing attrition, mainly for high-value, at-risk customers. A promotion for the right add-on product and a targeted cross/up/deep selling offer for customers with growth potential. Imposing usage limitations and restrictions on customers with bad payment records and bad credit risk scores. The development of a new product/offering tailored to the specific characteristics of an identified segment and so on. The current and expected/estimated customer profitability and value. The type of customer, the differentiating behavioral and demographic characteristics, the identified needs and attitudes revealed through data analysis and segmentation. The growth potential as designated by relevant cross/up/deep selling models and propensities. The defection risk (churn propensity) as estimated by a voluntary churn model. The payment behaviour and credit score of the customer. In order to better understand the role of these components and see the NBA strategy in action let's consider the following simple example. A high-value banking customer has a high potential of accepting a mortgage loan offer but at the same time is also scored with a high probability to churn. What is the best approach for this customer and how should he be handled / approached by the organization? As a high-value, at-risk customer, the top priority is to prevent his leaving and lure him with an offer that matches his particular profile. Therefore, instead of receiving a cross-selling offer, he should be included in a retention campaign and contacted with an offer tailored to the specific characteristics of the segment to which he belongs. Very interesting post. The idea of next best activity is very intuitive and encompasses well the goals of a company.